Fishing, food, golf and wine – it’s all on offer during this exclusive private journey. Fishing, food, and wine – this exclusive self-drive journey through New Zealand’s North Island has it all. Discover firsthand why the Tongariro River is the country’s fly-fishing capital. View the world’s biggest mainland colony of gannets at Cape Kidnappers. And seek adventures on foot, bicycle or horseback. Collect your rental vehicle and explore this harbour city at your leisure. Make your way to your accommodation on Waiheke Island, a two-hour drive away. Enjoy a gourmet food and wine tour of Waiheke Island, tasting fresh oysters, locally produced specialities and wine from the island’s top vineyards. Journey south to Huka Lodge on the Waikato River. Nestled in manicured grounds on the door step of the World Heritage-listed Tongariro National Park, this luxury lodge is your perfect base. Soak up the surrounds over pre-dinner drinks. Two full days’ fly-fishing on the Tongariro River. Let experienced guides introduce you to the most diverse range of rainbow and brown trout fly-fishing in the country. Later, feast on a tasting menu of sustainably sourced ingredients, such as spanner crab and John Dory, matched with the region’s finest wines. Journey upstream to the thunderous Huka Falls for a thrilling jet-boat ride. 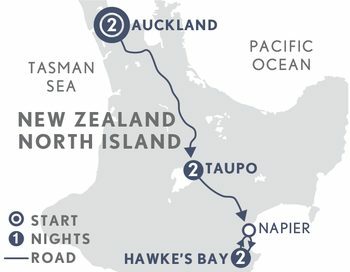 Continue to Hawke’s Bay and The Farm at Cape Kidnappers. This magnificent property sits atop rolling hills and rugged cliffs with infinite ocean views. Join your guide on a discovery of the 6,000-acre working sheep and cattle farm on which your 5-star retreat is located. Witness the highly-trained farm dogs muster sheep. Trek across hidden trails to see the largest, most accessible mainland colony of gannets in the world. If you are feeling adventurous, take a picnic and venture to the colony by mountain bike. Drive to Napier Airport for your onward flight.